Shopping local feels good at The Traveling Bazaar | Oh, the Places We See . . . 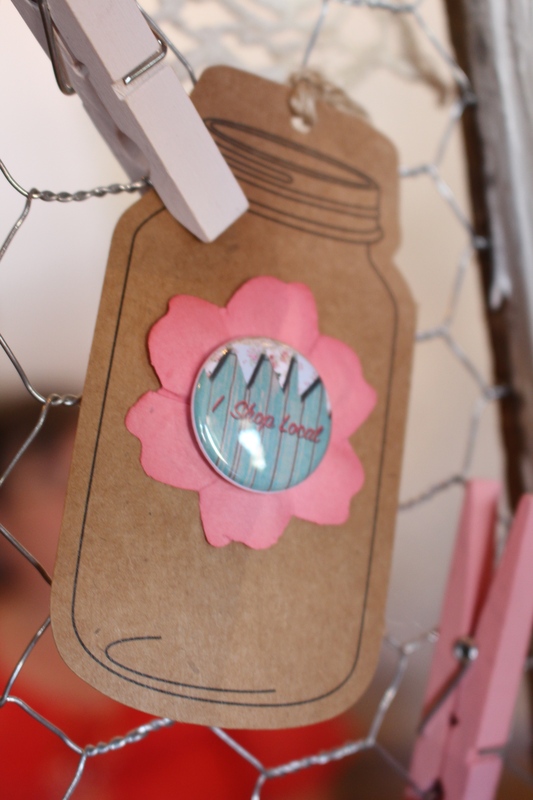 Cute “Shop Local” gift tag made by Tamara Cook at The Traveling Bazaar. As a former antiques dealer and flea market hound, I loved the idea of The Traveling Bazaar. 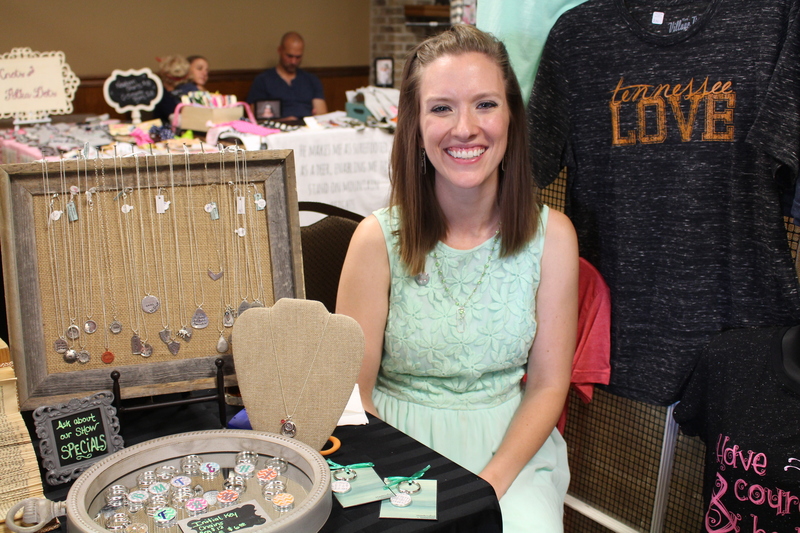 Brainstorm of organizer Tamara Cook, this gathering of artisans, antiques dealers, and in-home makers of goods I love known as The Traveling Bazaar appears (not by magic, of course) once a month at Buddy’s Banquet Hall in Knoxville’s Bearden area. 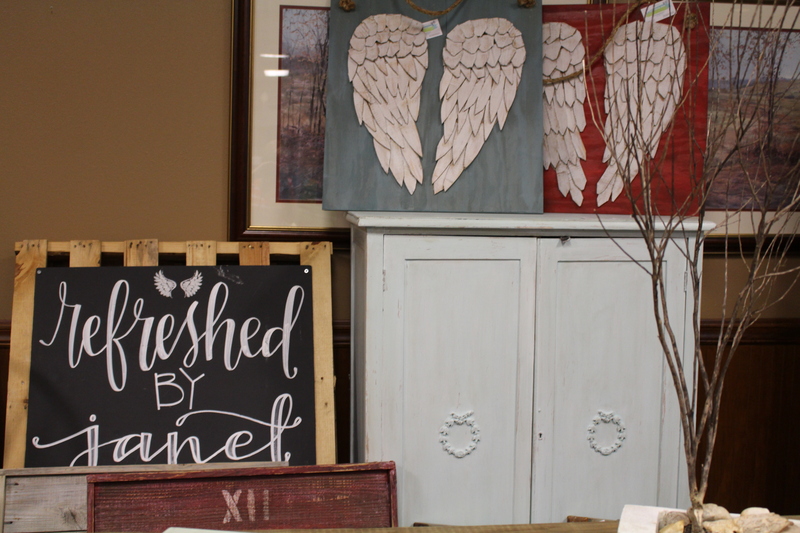 My first foray into the world of hometown, hand-made decor and vintage finds came on June 14, 2015, and The Traveling Bazaar can be summed up in one word: delightful! Tamara greeted me at the door, ebullient over the turnout of both vendors and shoppers. Her husband watched from the photo area where shoppers stood near props and posed for pictures — mostly while giggling and having fun! At each monthly gathering of the mostly young craftswomen (and some men, too), The Traveling Bazaar collects goods for a cause. This month, proceeds benefitted Knox County Library’s Book Drive, so the very welcomed donations sat piled up near the door. But the best was yet to come — inside the banquet hall. It was kind of an Etsy thing except the cute, homemade items, photography, and vintage finds were right in front of me, not online. See what you think of the quality and variety as you scroll through these pictures — and this is just some of what you could find inside. 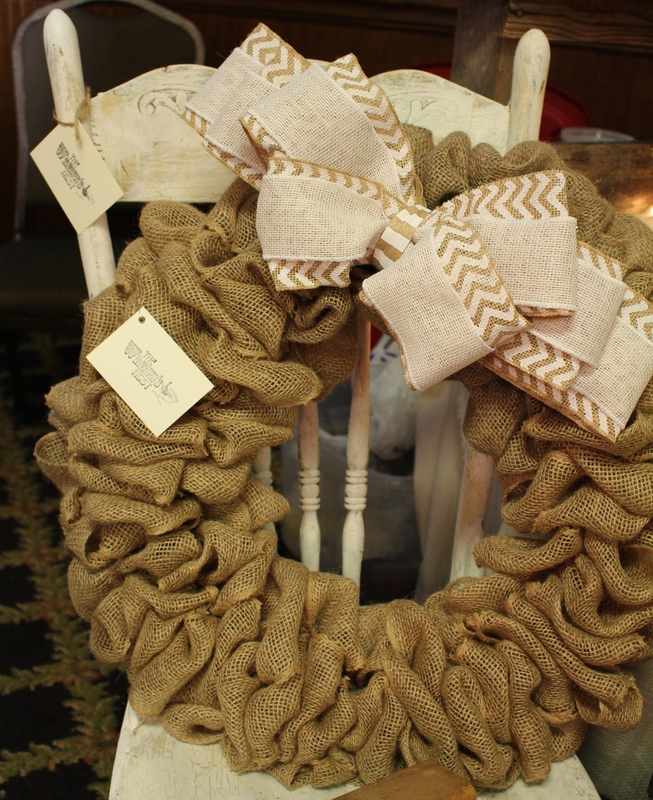 The Wrenn’s Nest (Facebook: the Wrenn’s Nest) bills itself as “A haven for rustic, urban chic farmhouse decor.” Owner Jessica Wrenn Hill makes and sells burlap pillows and wreaths along with her antique finds and distressed pieces. Her next stop? City Farmhouse Pop-up Fair in Franklin, TN the following weekend. 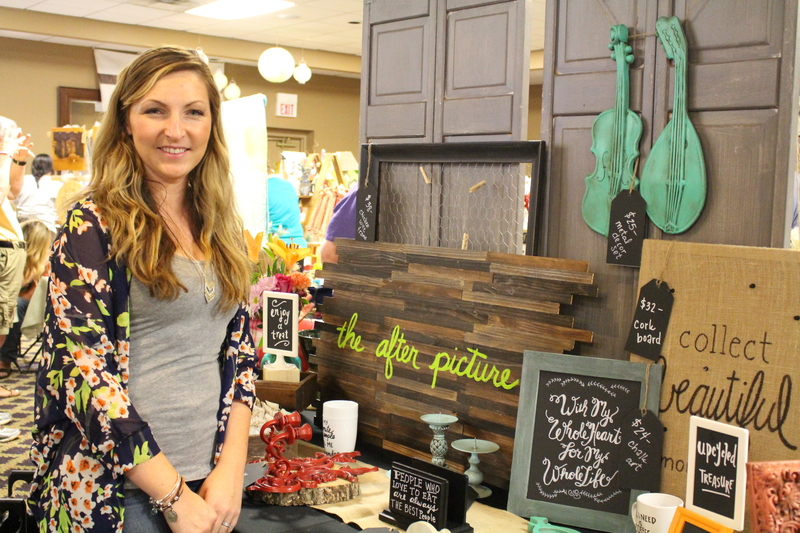 Jessica Wrenn Hill in her both surrounded by antiques and farmhouse decor. The Bead Designer (Facebook: thebeaddesigner; Website: thebeaddesigner.com) offered “affordable custom jewelry.” Artfully stacked bracelets competed with strands of beads on wire mannequins in this booth by designer-owner Nancy L. Smith. 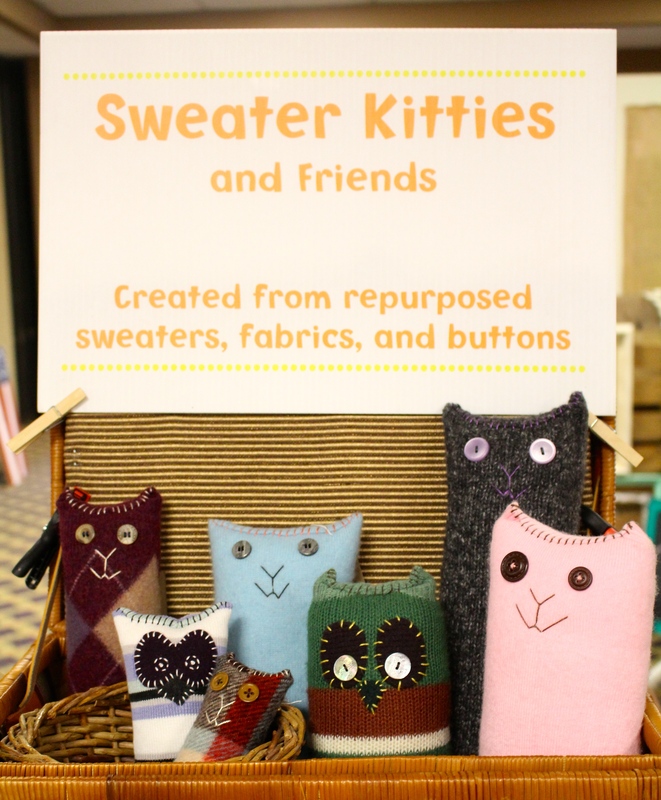 Peering straight at me from their safe haven in an old suitcase, these cute kitties seemed happy to have been crafted of recycled sweaters and wool clothing. Designer/artist/owner Cindy Brown Bensey calls her appealing creations “fun, eco-friendly art” under the name of her business, Zuparoo! And you can find her felines on Facebook (ZuparooArt) or Etsy (zuparoo.etsy.com). 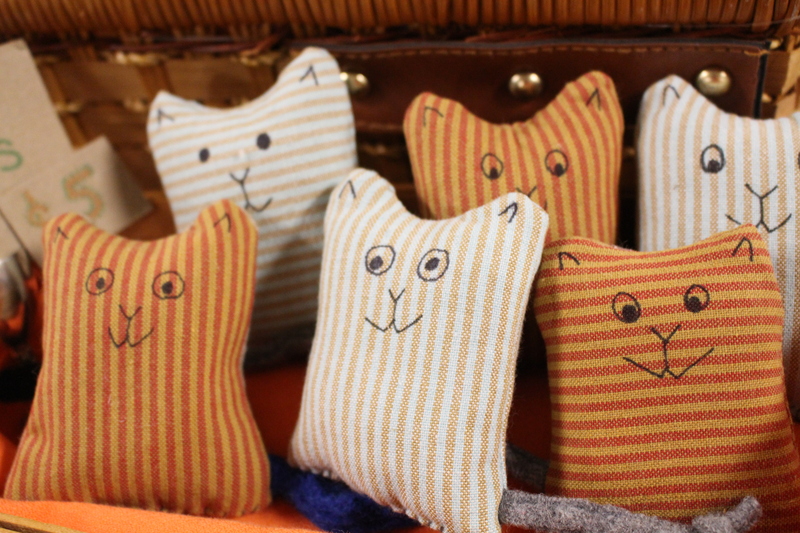 Catnip-filled kitties looking for a home! Refreshed by Janet (Facebook: RefreshedbyJanet) brought repurposed items, some with an industrial feel, to the show. But accessories came, too — like angel wings and art on wood. Soft colors, vintage feel, all finished nicely. Farmhouse and industrial chic items from the Refreshed by Janet booth. If you check out The After Picture by Rachel Converse on the web (theafterpicture.com), you’ll find “artistic services” which I translate to mean cute painted sayings on burlap and chalkboards. But there’s more. If you like pretty baked goods (think swirly-topped cupcakes), check out the Facebook page for The After Picture, too. 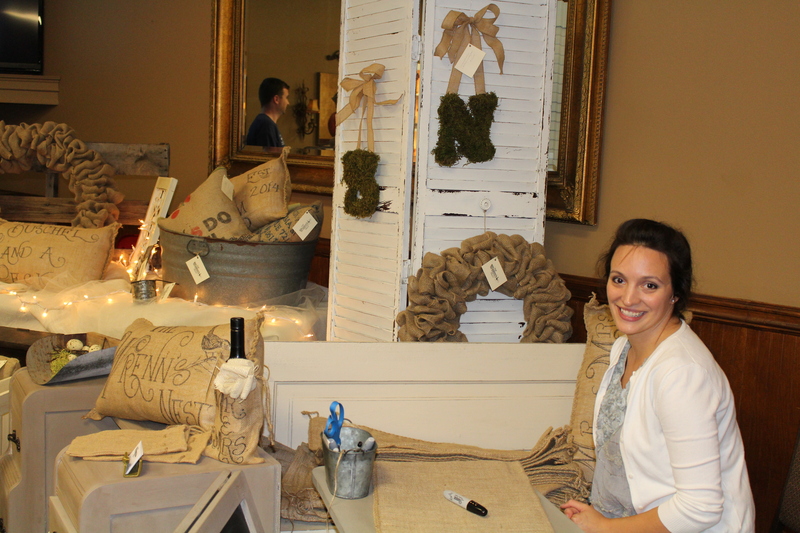 Rachel Converse brought many of her painted-on-burlap sayings to The Traveling Bazaar. 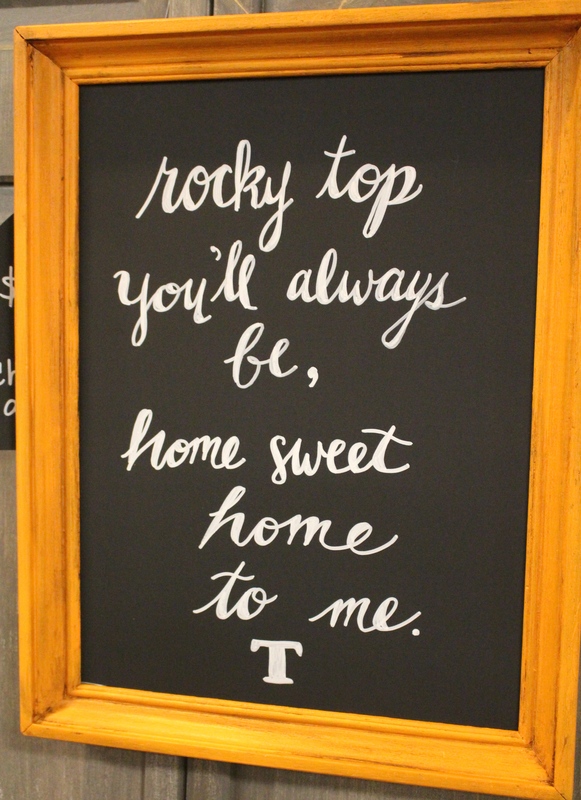 What Tennessee fan could resist this line from “Rocky Top”? H & H Botanicals (HandHBotanicals.org) is also a full service floral and garden design company. 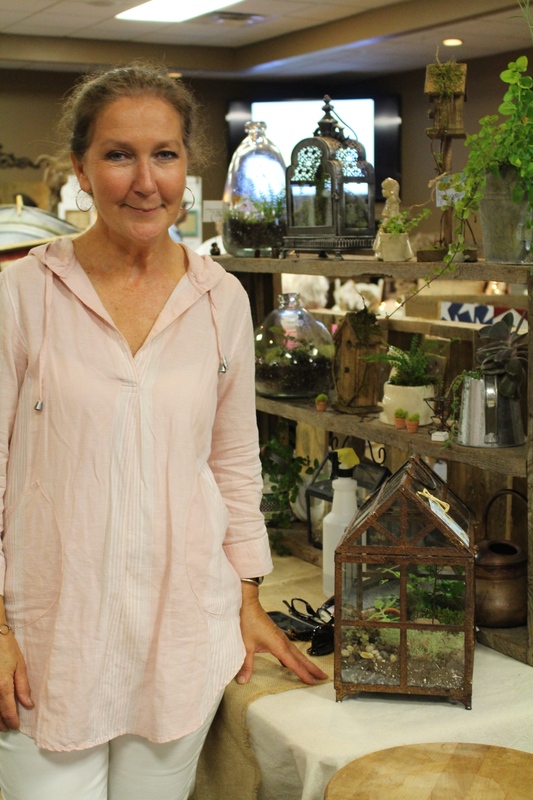 Owner Liz Horton creates terrariums in most anything from brandy snifters to miniature greenhouses. And a little whimsy makes you smile! 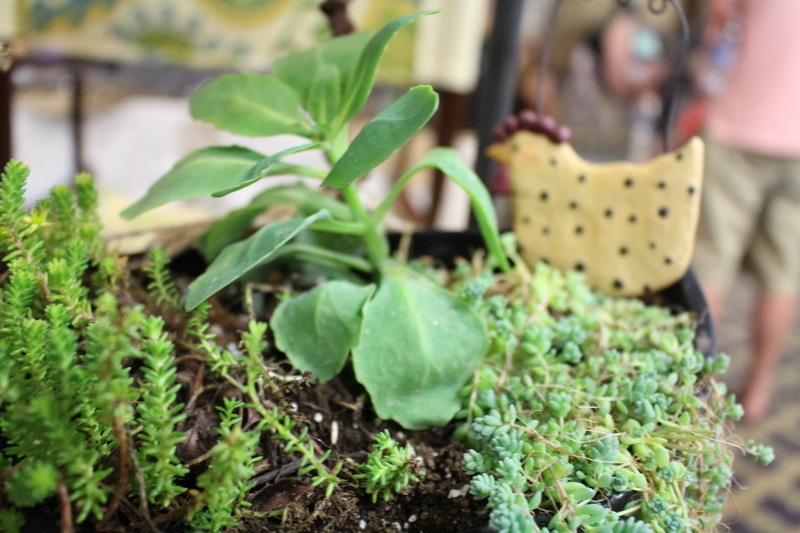 Liz Horton of H and H Botanicals creates terrariums and floral designs. Randy Gleckner (aka Captain Sawdust) just sat around playing. Yes, playing — with the wooden tops he created through his business RiTTiK (etsy.co/shop/RITTIK). And you know what happens when a craftsman does that, don’t you? You want to play, too. And buy something. And I did both! It’s not all work at The Traveling Bazaar. 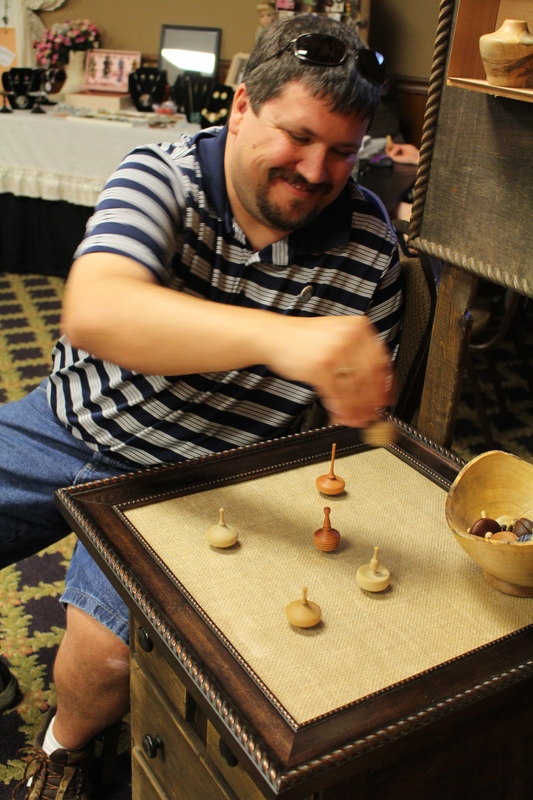 Randy Gleckner takes to spinning tops in his booth at The Traveling Bazaar. 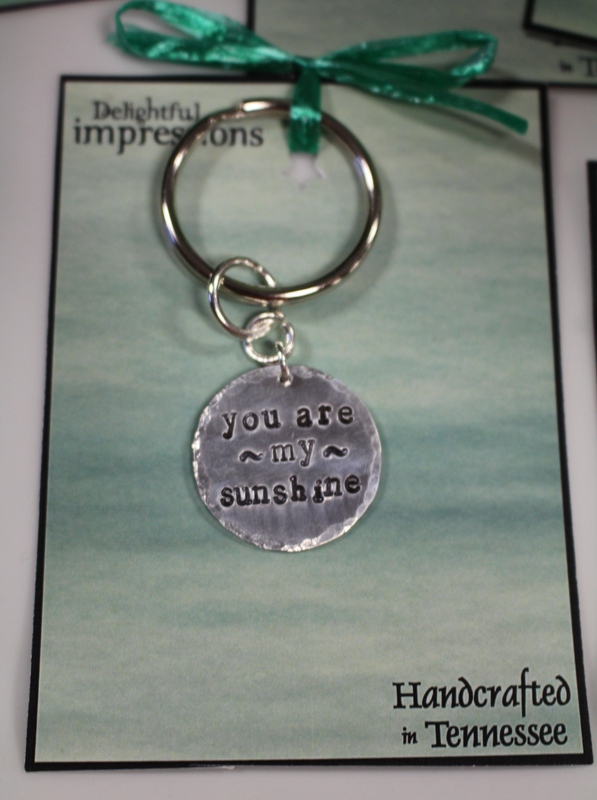 And then there was jewelry from Delightful Impressions (delightfulimpressions.com). Designer Joanna Tinker hand-stamps metal for necklaces, key chains and bracelets and then sells them on Etsy (thetinkerbelle.etsy.com). 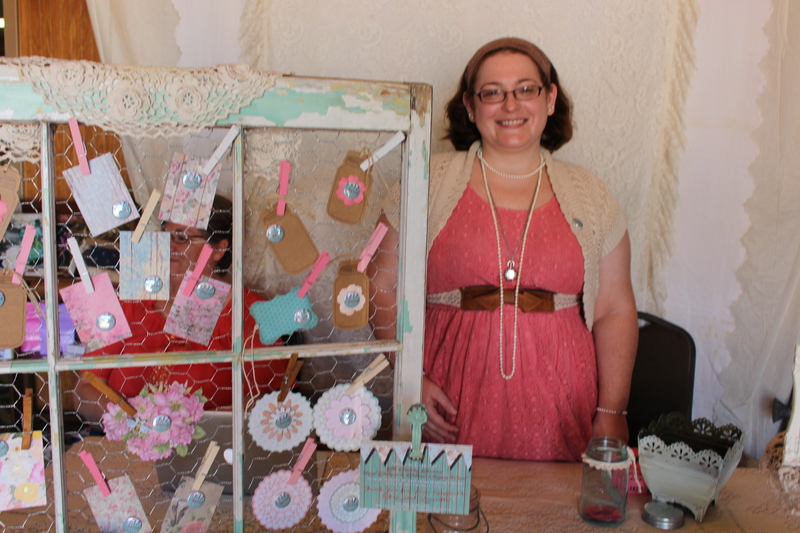 Just glad she came from Alcoa, TN that day so I could meet someone as delightful as the products she sells. 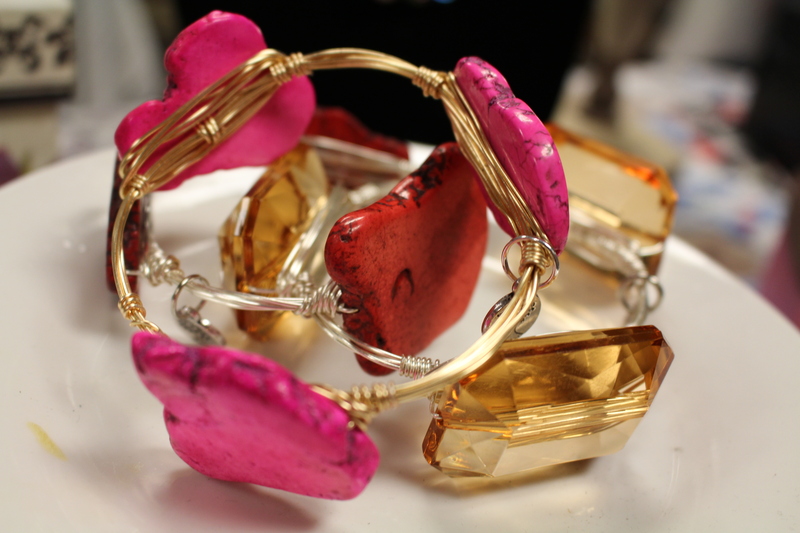 Joanna Tinker used a lot of burlap in her display of handmade jewelry. Simple Treasures Antiques & Vintage (Facebook: SimpleTreasures) brought depression glass, kitchenware, and vintage linens. But it was the display that kept shoppers engaged. Like dishes in a basket and banners draped atop old shutters. 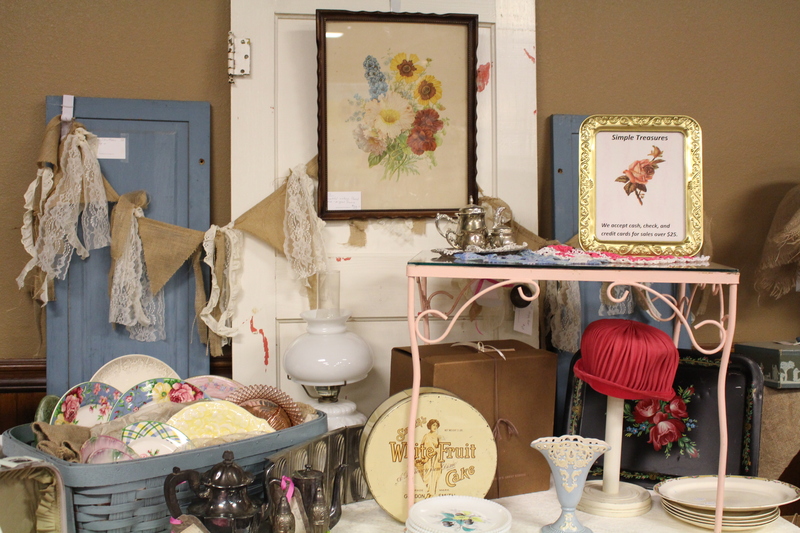 Artfully arranged vintage items filled the booth of Simple Treasures Antique & Vintage. And if you didn’t want to buy something but still needed a vintage look for a wedding or photo booth, Sweven Vintage and Rustic Rentals (Facebook: Sweven Vintage and Rustic Rentals) was on hand to talk to you about delivery and pricing. In fact, they’ll be setting up the photo booth at the next Traveling Bazaar on August 30th. Should be interesting to see what these ladies come up with! 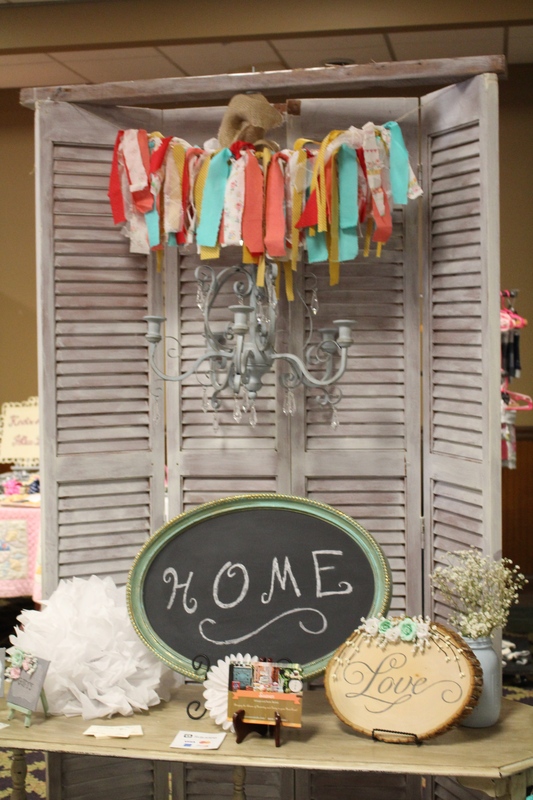 Cute display from Sweven Vintage and Rustic Rentals at The Traveling Bazaar. Now if this taste of the bazaar has you hungering for more, put that August 30th date on your calendar. Same great location. Same great air conditioned banquet hall! You’re bound to find something you need want. Until then, check out the website for Traveling Bazaar. It’s fun to dream. 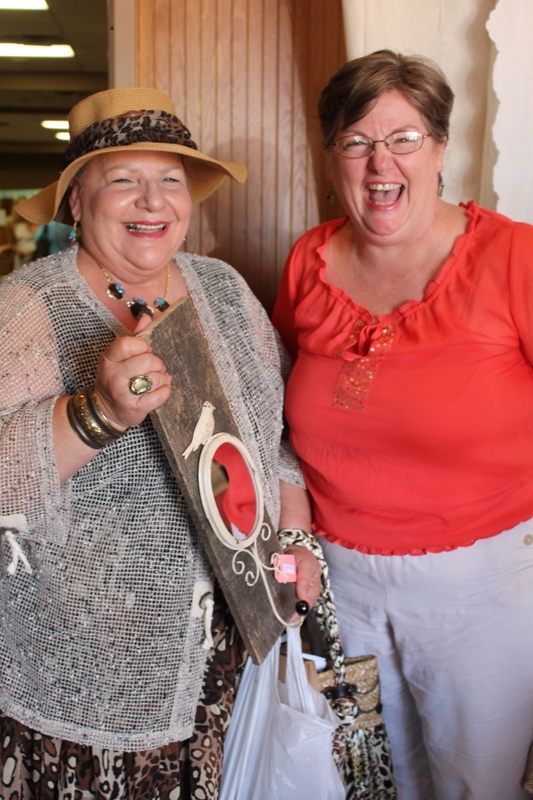 Lynn Lowery of Knoxville shows off her purchases to Karla, a friend of organizer Tamara Cook, at The Traveling Bazaar. This entry was posted in Retail Shops, Tennessee, Travel and tagged Cindy Brown Bensey, Jessica Wrenn Hill, Joanna Tinker, Liz Horton, Lynn Lowery, Rachel Converse, Randy Gleckner, Tamara Cook, Traveling Bazaar. Bookmark the permalink. Wow! What a fun idea!! Great, creative minds all in one place. I like this idea, too. Had seen it done in other cities, but not in mine. So, here’s hoping quality vendors keep returning each month! Appreciate the comment, Martha. You said it, Amy! All were pretty. I especially like seeing what young people use to decorate their homes — lots of burlap, chalkboards, and vintage pieces. Fun, right? I am always amazed at the creativity of people who work with their hands and applaud their hard work. I agree. But you should know best since you, too, are a creater and doer! Thanks for taking a look. Thanks so much. And thanks for inviting me. Love this event! I’m looking forward to the August event. And now that I know what to expect, I’ll bring more money!